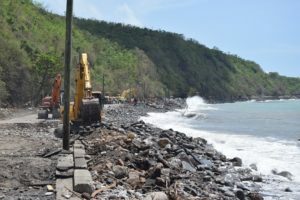 Basseterre, St. Kitts – The hazardous conditions on the Old Road Bay – posing a danger to motorists because of sea swells, land erosion and rock slides during adverse weather – are soon to be resolved as EC$23 million was allocated in the 2018 Budget for its rehabilitation. While appearing on the government’s weekly programme “Working for You” Dec. 13, the Honourable Ian “Patches” Liburd, minister of public infrastructure, said that he is pleased that the Old Road Bay will be undergoing reconstruction in the coming years because it is a critical link in the entire island road network and needs to be accessible for motorists. He explained that an assessment of the area was done to come up with various options to mitigate against the challenges faced with the road posing a danger to motorists and becoming impassable during adverse weather. “The option that we have chosen will address both the land side and the sea side,” said Minister Liburd, while explaining that the reconstruction plan for the road will encompass raising the level of the road through reclaiming the land on the sea side. He noted that a technical study done from September to November revealed that the land reclamation would be the most suitable option to address the reconfiguring of the Old Road Bay. The Old Road Bay Project is expected to start in January 2018 in order to petition bids for the design and construction of the road while the actual construction is estimated to begin in early 2019.